There's an emoji for nearly everything on our phones...except ones representing disabilities. Apple's hoping to change that: The company issued a proposal this month requesting the addition of nine types of emoji inclusive of individuals with disabilities. As it noted, "Diversifying the options available helps fill a significant gap and provides a more inclusive experience for all." Obviously, this is a Really Good Thing, although you wonder why it took Apple or anyone this long. Two years ago, the British disability advocacy group Scope created 18 emojis depicting people with a range of abilities, which they made available to the public for downloads. 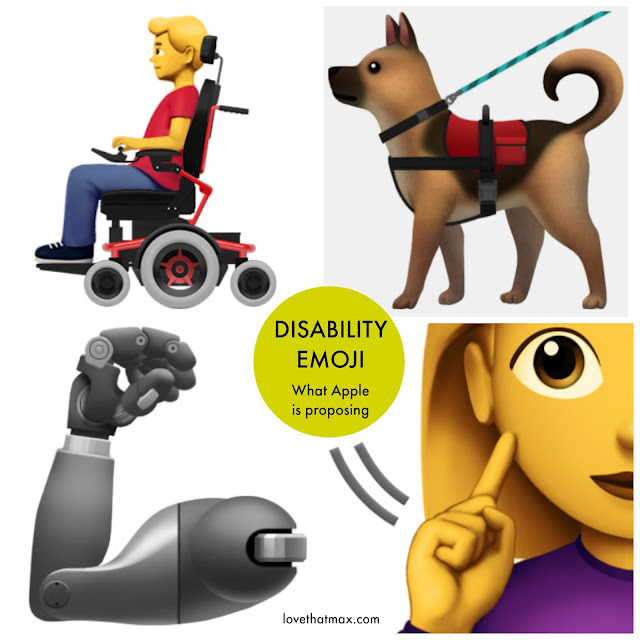 Apple worked with the American Council of the Blind, the Cerebral Palsy Foundation and the National Association of the Deaf to come up with the emoji, hopefully consulting with people with disability as part of the process. The images are prototypes—there will be a variety of skin tones. Apple noted that this isn't meant to be a comprehensive list of all depictions of disabilities—it's a starting point. As the mother of a child with cerebral palsy, I'd like to see a person with orthotics represented. It would also be awesome to see someone using a communication device. I’m excited that if these emojis happen, there will be one of a hearing aid. And it actually looks realistic! I'm so excited about this! I can already see myself overusing them way too much!